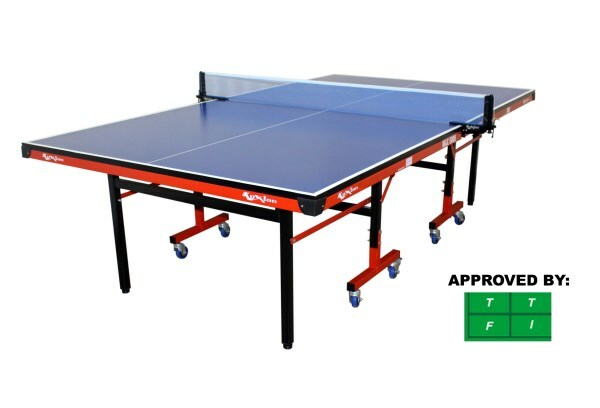 Table Tennis Table - Leisure (TTFI Approved) is specially designed for tournaments and competitions, made of high quality 25 MM thick pre-laminated particle board (both sides are laminated) with faster speed and even bounce. Comes with lockable wheels and levelers. Size and dimensions of this model are as per international standards. Easy to install and includes in package a TT Table, TT Net, Net Stand and a User Manual. KX-TTL2525 TTFI Approved. 25 MM Laminated Board, Frame Size 60 MM x 20 MM, Leg Size 100 MM x 50 MM, 125 MM Wheels and Comes in a Standard Size. 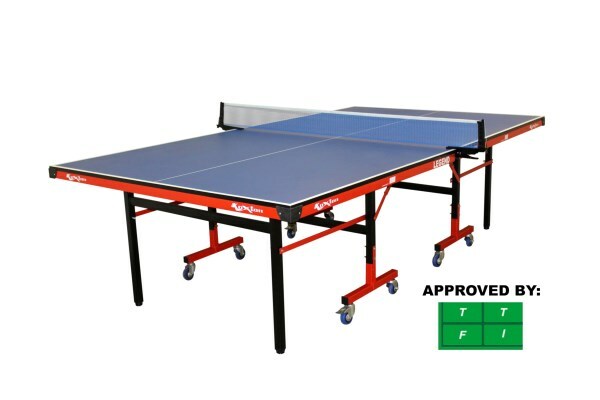 Table Tennis Table - Competition (TTFI Approved) is specially designed for tournaments and competitions, made of high quality 25 MM thick pre-laminated particle board (both sides are laminated) with faster speed and even bounce. Comes with lockable wheels and levelers. Size and dimensions of this model are as per international standards. Easy to install and includes in package a TT Table, TT Net, Net Stand and a User Manual. KX-TTC2500 TTFI Approved. 25 MM Laminated Board, Frame Size 50 MM x 25 MM, Leg Size 50 MM x 50 MM, 100 MM Wheels and Comes in a Standard Size. 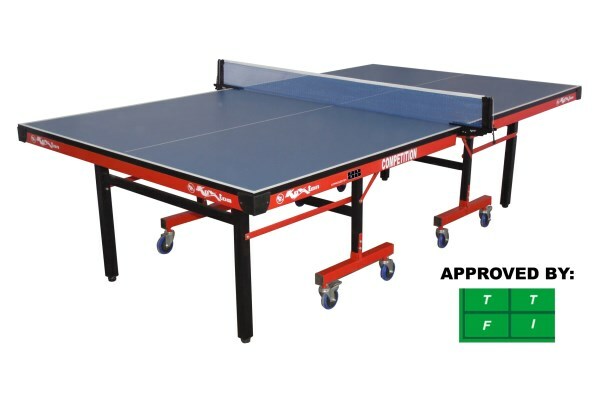 Table Tennis Table - Legend (TTFI Approved) is specially designed and perfect for Tournaments, Competitions, Sports Clubs, Schools, Universities and Corporate Offices, made of high quality 18 MM thick pre-laminated particle board (both sides are laminated) with faster speed and even bounce. Comes with lockable wheels and levelers. Size and dimensions of this model are as per international standards. Easy to install and includes in package a TT Table, TT Net, Net Stand and a User Manual. KX-TTL1875 TTFI Approved. 18 MM Laminated Board, Frame Size 38 MM x 25 MM, Leg Size 38 MM x 38 MM, 75 MM Wheels and Comes in a Standard Size. 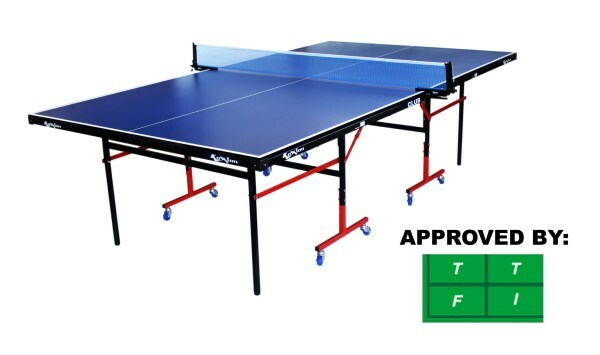 Table Tennis Table - Club (TTFI Approved) is specially designed and perfect for Sports Clubs, Schools, Universities, Corporate Offices and Playing for Fun at Home, made of high quality 18 MM thick pre-laminated particle board (both sides are laminated) with faster speed and even bounce. Comes with lockable wheels and levelers. Size and dimensions of this model are as per international standards. Easy to install and includes in package a TT Table, TT Net, Net Stand and a User Manual. KX-TTC1875 TTFI Approved. 18 MM Laminated Board, Frame Size 31 MM x 20 MM, Leg Size 25 MM x 25 MM, 50 MM Wheels and Comes in a Standard Size. Table Tennis Table - Magna is specially designed and perfect for fun playing and general practice at Home, Offices, Schools, Universities and Sports Clubs, made of high quality 18 MM thick pre-laminated particle board (both sides are laminated) with faster speed and even bounce. It is foldable model and comes without wheels. Size and dimensions of this model are as per international standards. Easy to install and includes in package a TT Table, TT Net, Net Stand, User Manual & Required Hardware for Installation. 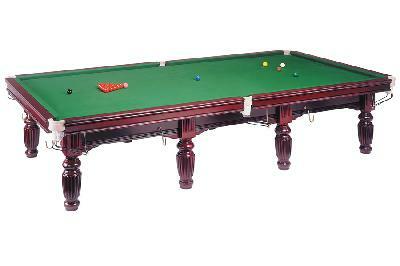 Table Size : 270 x 150 x 76 CM (Standard Size). Frame Size : 31 x 20 MM, Leg Size - 25 x 25 MM. Board Size & Type : 18 MM Pre-Laminated Particle Board (Both Sides are Laminated), Rust Proof Coating, Smooth Surface, Easy Installation, Extra Protectors on All Corners, Base Frame Made of Steel. 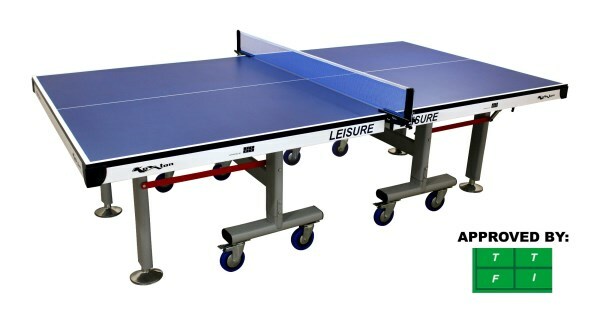 Perfect TT Table for fun playing and general practice at Home, Offices, Schools, Universities and Sports Clubs. Includes in Package : TT Table, TT Net, Net Stand, User Manual and Required Hardware for Installation. KX-TTM1800 18 MM Pre-Laminated Particle Board. Table Size : 270 x 150 x 76 CM (Standard Size), Frame Size - 31 x 20 MM, Leg Size - 25 x 25 MM. 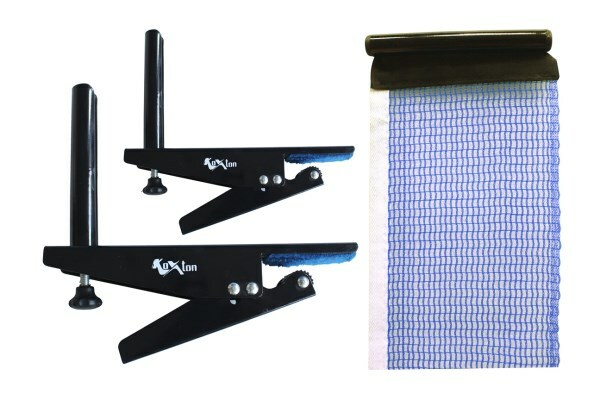 Easy to install and includes in package a TT Table, TT Net, Net Stand, User Manual & Required Hardware for Installation. 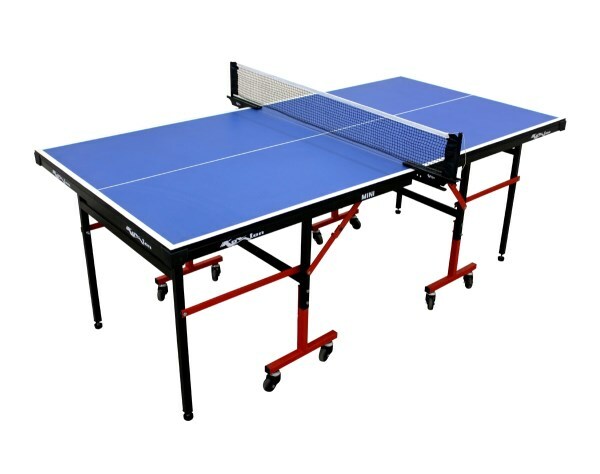 Table Tennis Table - Mini is specially designed and perfect for Kids & junior students and can be used anywhere like Home, Schools & Sports Clubs, made of high quality 18 MM thick pre-laminated particle board (both sides are laminated) with faster speed and even bounce. It is a foldable model and comes with lockable wheels. Sizes and dimensions of this model are less than regular TT Table. Easy to install and includes in package a TT Table, TT Net, Net Stand, User Manual & Required Hardware for Installation. Table Size : 180 x 90 x 67 CM (Mini Size). Frame Size : 31 x 20 MM, Leg Size - 25 x 25 MM, Wheel Size, 50 MM. Board Size & Type : 18 MM Pre-Laminated Particle Board (Both Sides are Laminated), Rust Proof Coating, Weatherproof Table, Smooth Surface, Easy Installation, Extra Protectors on All Corners, Base Frame Made of Steel. KX-TTMI1800 18 MM Pre-Laminated Particle Board. Table Size : 180 x 90 x 67 CM (Mini Size), Frame Size - 31 x 20 MM, Leg Size - 25 x 25 MM, Wheel Size, 50 MM. Easy to install and includes in package a TT Table, TT Net, Net Stand, User Manual & Required Hardware for Installation. 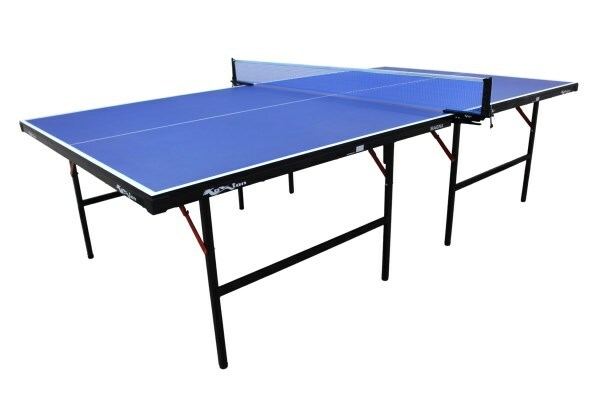 Table Tennis Table - Max 5000 (TTFI Approved) is specially designed and perfect for Tournaments, Competitions, Sports Clubs, Schools, Universities and Corporate Offices, made of high quality 25 MM thick pre-laminated particle board (both sides are laminated) with faster speed and even bounce. Comes with lockable wheels and levelers. Size and dimensions of this model are as per international standards. Easy to install and includes in package a TT Table, TT Net, Net Stand and a User Manual. KX-TTMX5000 TTFI Approved. 25 MM Laminated Board, Frame Size 38 MM x 25 MM, Leg Size 38 MM x 38 MM, 75 MM Wheels and Comes in a Standard Size.